Some young kids being ‘antisocial’, and cycling on the pavement. Now that cycle tracks have been built on this road (in place of one of the vehicle lanes) this kind of behaviour will almost certainly disappear – there will be no need to cycle on the pavement, now that attractive conditions for cycling exist away from it. Pavement cycling in the Netherlands is, to all practical purposes, non-existent, for precisely this reason. There is no need to cycle on a pavement because there will be a much more suitable alternative beside it, both in terms of comfort and attractiveness. Why would you cycle on the pavement here? 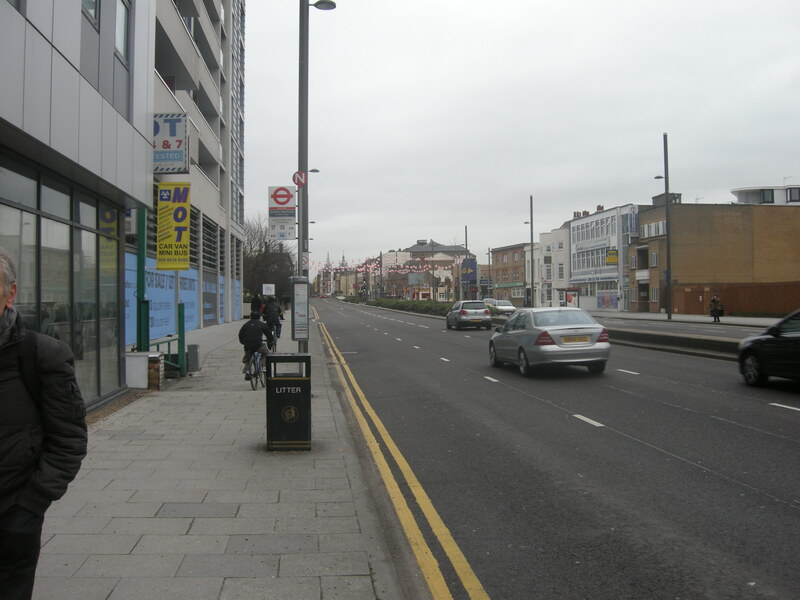 These are all busy roads with – in particular – a high volume of bus traffic. Without cycle tracks a significant proportion of these people would either be cycling on the pavement, or would not be cycling at all. The presence of cycle tracks creates pedestrian environments that are free from uncertain interactions with people cycling. 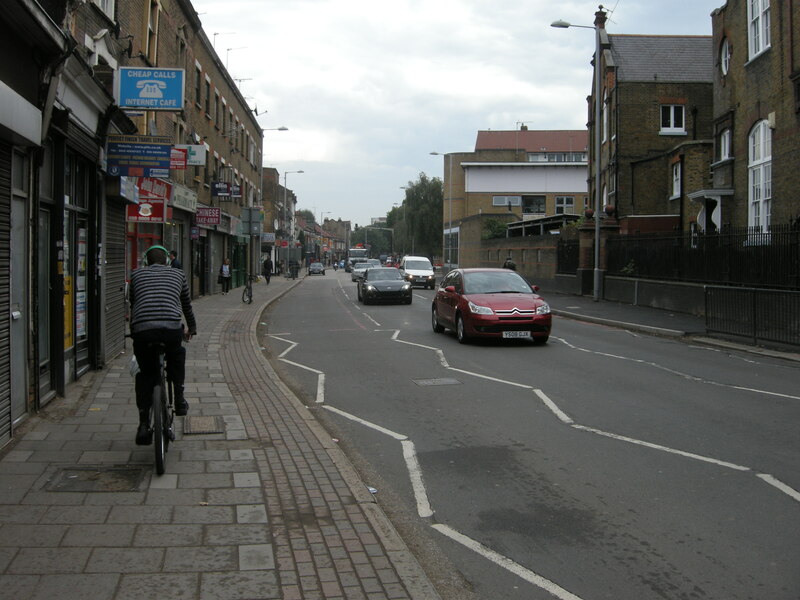 By contrast, when the pavement is the most attractive place for cycling on a given road or street, we should not be surprised when people choose to cycle on it, regardless of potential fines or penalties. Indeed, if there is a problem with pavement cycling in a given area, it is an almost certain sign that conditions for cycling there are far from attractive for the vast majority of people. The proper response in these kinds of situations should not be to clamp down, or to increase patrols and fining operations – not least because this would be a disproportionate use of police resources. (Although of course I am not arguing that genuinely anti-social and dangerous cycling on the pavement should not be dealt with). Pavement cyclists aren’t seen as heroes, but perhaps they should be… in Britain we are taught that pavement cycling is a problem and that it’s wrong; though in truth it is neither. Today, Bradley Wiggins is the great hero of British cycling, and I hope he enjoys all the adulation he richly deserves. But in the meantime, the great unsung heroes of British cycling – pavement cyclists – bravely pedal on, or try to any which way they can. They are not celebrated; they are seen as deviant, and are demonised. Because the vast majority of people feel there is nowhere safe to ride, everyday cycling across the UK is being very effectively and very systematically blocked. Much premature talk of ‘a cycling revolution’ conveniently ignores the fact that a big majority of people are afraid to cycle, and will not start anytime soon unless something fundamentally changes. In the meantime, in most places most of the people who do ride a bicycle do so (either always or mainly) on the pavements. They ride either because they have no alternative – for example, needing to get to shift work (rendering public transport infeasible) at a location beyond walking distance – or because they actually like cycling but they just don’t like cycling in roads full of cars, trucks and buses. 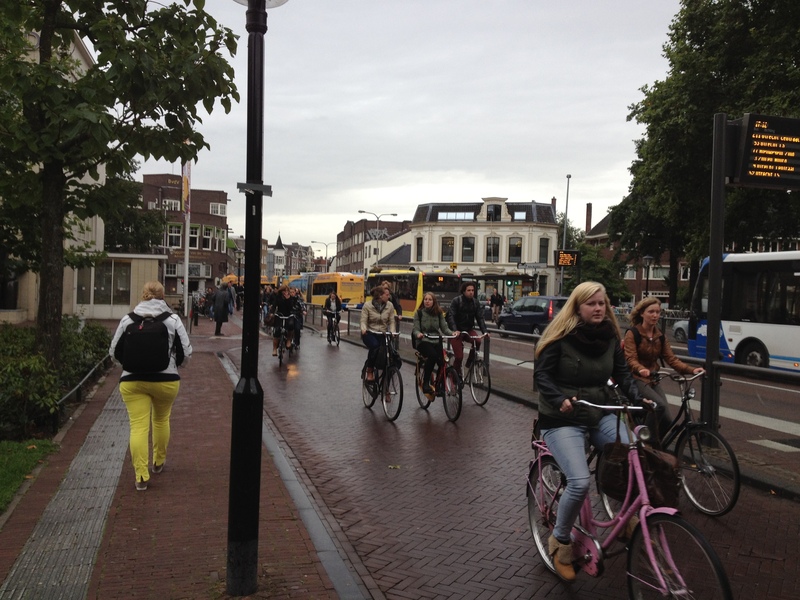 The people in the pictures above are cycling despite the conditions, not because of them. Their journeys – and the trips of the people on foot that they are cycling around – should be made easier and more pleasant. Separating cycling from motor traffic benefits pedestrians, as well as those on bikes. An ideal way to make common cause with pedestrian groups? 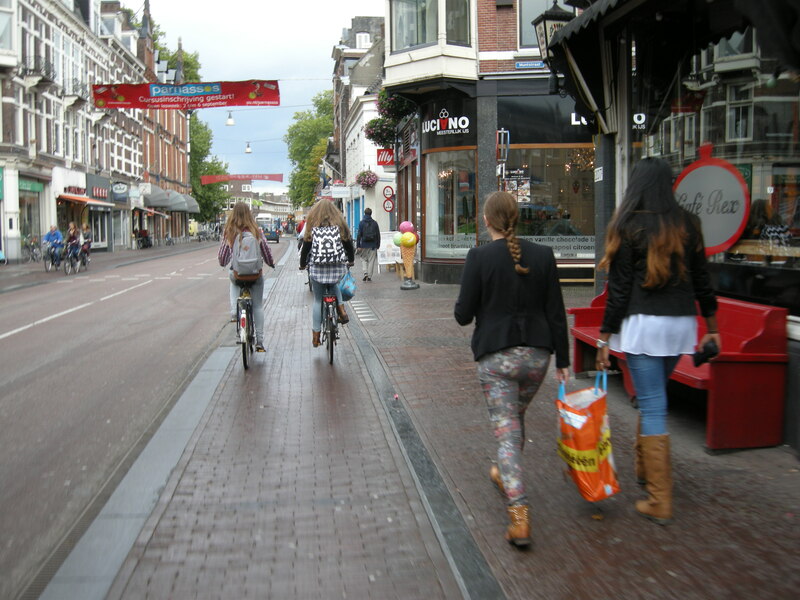 This entry was posted in Pavement cycling, Subjective safety, The Netherlands. Bookmark the permalink. Those photos of the Netherlands fill me with dread! How on earth are you supposed to cycle longer distances at a decent speed (I average around 12 -14mph on my commute 31 mile round trip into London, and it’s mostly my own fitness stopping me from increasing that much further) when there are so many bikes being pushing into such a narrow path? If that came to London, I’d have three choices – give up cycling to work, battle it out on whatever roads are left for motorised vehicles or – you’ve guessed it! – ride on the pavement! Someone will be along shortly asking me to think of the majority, but if thinking of the majority is going to push me off my bike on my commute, I’m going to fight for the status quo at every opportunity I get! Chris, you can cycle very easily at 12-14 mph on the tracks in these pictures, and an average speed across the city of that speed is very easy to achieve. When I took these pictures I rode from one side of the city to the other (about 3 miles) and I only had to put my foot down four times, travelling at at least 12mph for the whole trip. This is also the very centre of the city; that’s why there are huge numbers of people cycling here. It’s just not appropriate to be cycling fast here, with huge numbers of people about. Further out, you can go as fast as you like. Just a few miles from the city centre, cycle paths will look like this in the suburbs. Wide and fast, and with fewer people on them. You have nothing to fear from Dutch infrastructure. And you’re going to ride on the pavements in London that fast how? No you wouldn’t because you’d be slowed down by loads of pedestrians walking even slower. Just to agree with the others. We spent two weeks cycling in the Netherlands this summer. Saw lots of lycra clad riders on road bikes going fast on the cycle tracks (often in couples which you rarely see in the UK). But also thousands of ordinary people in normal clothes carrying lots of stuff and mostly averaging 12-14mph. We rode right to the centre of Eindhoven with a normally nervous teenager. No problems at all. It did much faster rides on my own and no problems, in fact hard rides are harder because you get so much priority you don’t get to rest at junctions so much. I assume you’re not suggesting that you saw lycra clad riders on road bikes travelling quickly on cycle paths with the levels of traffic illustrated in the photos in this blog? 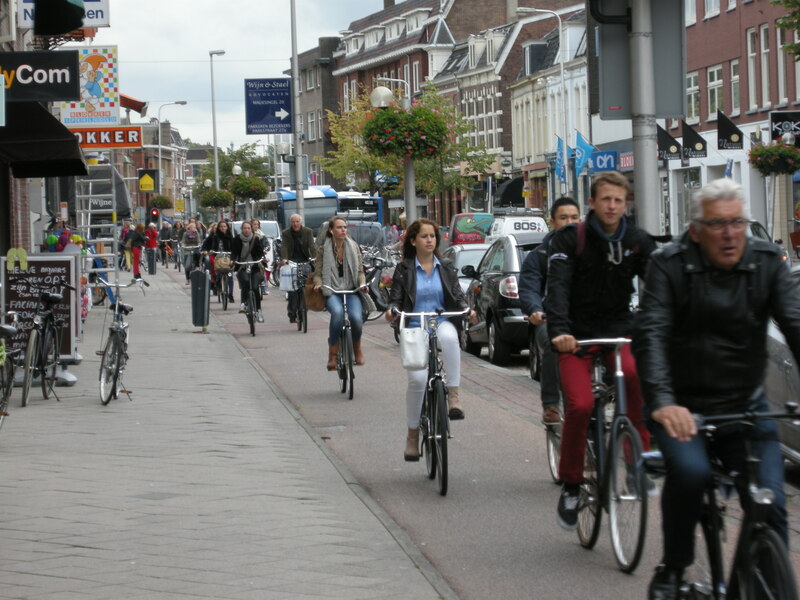 I suppose many people trying to make a point about Dutch cycling infrastructure deliberately choose to use photos of very congested areas such as those shown above to show the sheer number of cyclists there are there, and maybe areas quite so congested are a rarity? In the Netherlands they rode fast when they could which was most of the time. Frequently we saw them heading away from town towards the countryside. After all why would you go to the centre of town if you want to go for a hard training ride? Between towns there was plenty of space for them to put the hammer down. The thing is that it is a complete network, everywhere is safe. We had zero conflicts with fast cyclists and zero conflicts with vehicles. But the infrastructure is almost impossible to imagine if you have only ridden in the UK. What is needed for a reliable, sane commute and what is needed for sportive training are not the same thing for most of the people, most of the time. And transport planning should actually be about most of the people, most of the time. I would suggest that someone wanting to ride 30 odd miles a day at relatively high peak speed with lots of stop-start over 80 sets of traffic lights is not “most of the people, most of the time”, and while you might dread a change there are a lot of others who’d embrace it. You can imagine how any Britisher would scratch his head about the absurd notion that you might be *faster* driving a car, in Britain, on the grass strip alongside any road. Can you then imagine how weird it is for me, a Dutch woman, to read how anyone would think it would be better and faster to ride a bicycle amongst motorised traffic? Well, if you can’t, let me tell you that I am totally flabbergasted. I don’t think you’re making the right comparison there. At present, for the large majority of my route, I have the full width of CS7, plus the additional width of the whole of the rest of the bus lane available most of the time too. If you were to condense this into a cycle path the width of those shown in the article, the motoring equivalent would be taking the traffic on all three lanes of the M4 and telling them they’ve all got to go and drive up a single lane instead. This might not cause too many problems at quiet times, but the M4 is busy enough as it is with 3 full lanes during rush hour, just as CS7 is with a full bus lane available to it. 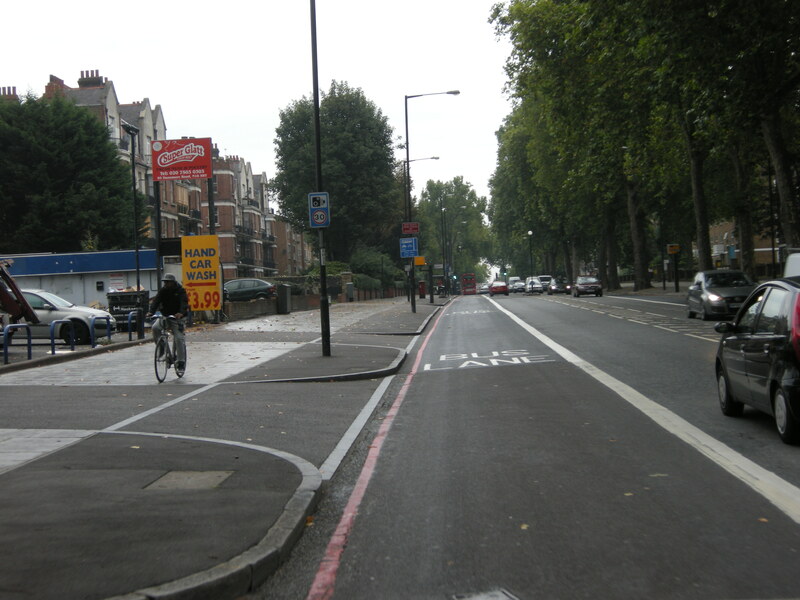 If you then assume that the number of cyclists wanting to use the route increases dramatically (as it is now segregated, and therefore safer), you’re rapidly at a point of congestion that means the grass strip, even if it’s much, much slower than the current set up, eventually becomes the faster option. You have to make your own decisions on how you commute, it might be that your best option is to choose another transport method for two days on which you currently cycle to work. On the brightside more people will have the opportunity to cycle and enjoy the benefits that brings. To average 12-14mph in the UK you are riding at 20mph+ between stops at traffic lights, etc. To average 12-14mph in the Netherlands you are riding at 12-14mph. I was amazed when I visited family over there, I was riding slower but with shorter journey times for similar distances. You’re correct, I am riding at about 20mph between lights. It would be lovely not to have the lights – of which there are 81 sets on my commute – but I think it’s beyond the realms of fantasy to think that London would ever be able to get rid of them. However bike-friendly you try to make a route, people (whether on bikes, on foot or in motorised vehicles) still need to join, leave and cross the route, so how is that going to happen without the lights and junctions? CS7 already frequently has 40+ cyclists at each major set of lights in the morning rush hour once you get in towards Stockwell and Kennington, and riders will frequently be 3, 4 or even 5 abreast, filling not just the bike path but the rest of the bus lane as well in order to keep everyone flowing at their desired speed. 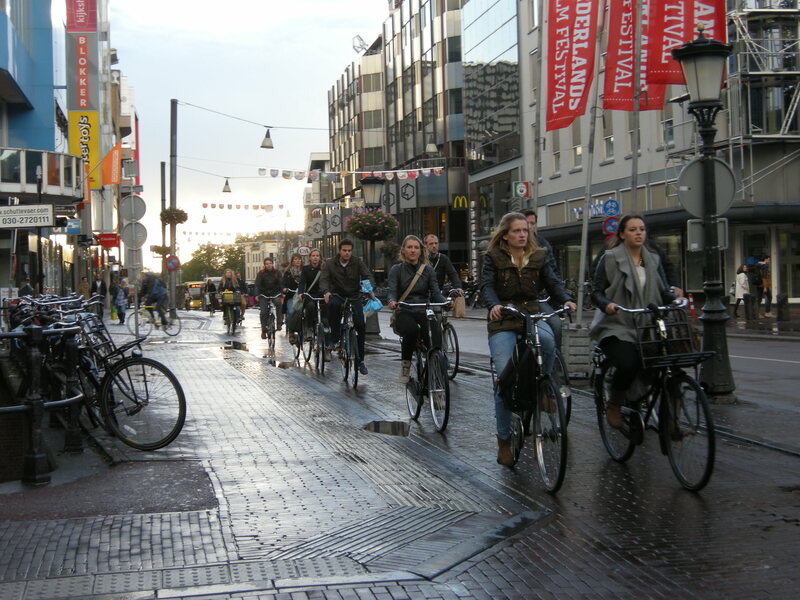 Push that into small lanes such as those pictured from the Netherlands, and how do people keep moving at a decent speed? Maybe I’m unique, but whilst I do find traffic lights frustrating sometimes, at least they keep the journey more interesting and I get more of a workout. Even without traffic lights, having to do the whole ride sat at a trundle behind someone on a shopper bike would be utterly unbearable, even if it wasn’t actually taking much longer! As CS7 currently stands, I actually look forward to my commute to work! Long may it remain the case…. And let the children and elderly be damned! I was told that on the main commuter routes into Amsterdam the lights are phased to give a ‘green wave’ to cyclists doing 20kph, so once you hit one green all the other lights will be green for you; the green wave is reversed in the evening. One of the great things I found about cycling in Belgium and Netherlands is that the routes are often taken away from faster vehicle roads meaning that there are no real junctions to talk of since you’re many times nowhere near the traffic. Also, I remember getting quite annoyed at the law in Netherlands that you can’t cycle on a main road if there is a cycle path nearby. In fact throughout most of the country these are not cycle paths but smaller routes for slow moving vehicles, that’s tractors, electric cars, bicycles, etc. The result was that these routes are quite wide and well surfaced and offering a fantastic way to get through the countryside, fast (we were averaging 20mph) and without the hinderance of traffic. While we were very happy not be annoyed by faster traffic I’m quite certain that they were also pleased not to be annoyed by our presence on a faster road. That would be lovely, but where would you put them in London, given how densely built upon the space already is? I suspect you are indeed unique. I have the same commute as you (CS7). And I’m astonished you look forward to riding it. Which bit is your favourite? Squeezing between the lorries and the buses on the run up to Newington Butts? Shuffling through traffic at the Oval lights? Swerving out into the middle / right hand lane on the way home in the evening on the way south towards Oval to prevent vans side-barging you? I look forward to actually being able to ride and get exercise! Obviously given the choice I’d rather be out riding around nice, quiet country lanes or the like, but there is no such thing on my commute, so I’ll take what I can get. If I wasn’t able to do that on my commute, then with three small kids, a full time job and a wife who can’t drive, I simply haven’t got the time to do it anywhere or anytime else, and having to do it at 12mph behind lots of shopper bikes in a narrow, segregated bike lane would render the whole experience totally unbearable, even if it wasn’t actually taking me any longer overall. As for your specific points…. 1. Coming up to Newington Butts, I assume you mean the traffic lights outside Toulouse Lautrec wine bar? If you want to try and squeeze through lorries and buses just to make sure you get to the front, you’re welcome to do so, but I struggle to understand why you would? You’ve got two lanes at the lights – the left hand lane is left turn only for everything except buses going ahead into the bus lane, and the right hand lane is straight on only. If you just wait your turn at the lights, you can go with the flow of traffic perfectly safely into the bus lane on Newington Butts itself. I’ve never been held up long enough to miss the lights, so fail to see why so many people feel the need to try and squeeze through to the front? 2. The Oval inbound. I generally get here around 08:15 – 08:30, and I never, ever seem to get through these on green, presumably as a result of my speed against the phasing of these lights and those leading up to them. I’d say here ties jointly with the lights outside Stockwell station as the second worst part of the ride, but owing to the time I get here, there are generally 20+ cyclists in the stop box by the time the lights change (to say nothing of the traffic-calming measures that are the muppets who more mornings than not have driven into the yellow crosshatching on the A202! ), so I don’t have a particular issue with it, no. 3. The Oval outbound. Again, I can see where you’re coming from, but this just doesn’t affect me. This, I assume, is once again as a result of the speed I ride at. I find that traffic coming down the A3 goes past me before I need to cross over the lane going onto the A23, and by the time traffic from Kennington road reaches me, I’m already safely across and in position to go through the lights. If you’re reaching that spot either before or after me, I can see how it would be a nasty issue though. So yes, none of this is as pleasant as riding for pleasure in beautiful countryside, but that doesn’t mean it’s not fun. When it really stops being fun is if I don’t make it to Colliers Wood by 7pm! Having to ride that route once the bus lane ceases to be a bus lane is a whole different world of horrible! Lets not forget, the Ramblers were all criminals walking in places they shouldn’t have been. And also there was specific direction to the Police from Government, not to fine people cycling on pavements where it was considered legitimate. There’s nothing much pleasanter than a family bike ride on a nice day .. or there shouldn’t be..
I’ve just tweeted a photo montage of some typical Surrey pavement cyclists which illustrates the kind of problem round here ( http://‪twitpic.com/djm0b5 ‬). Until safe and pleasant-to-use cycle infra is installed, I fully support what these parents are doing*. Let folk, who feel it is the only safe way, cycle on the footway as long as they do it considerately. And despite what the few who ask for crackdowns and people in authority who see conducting such ridiculous victimisation as a popularity contest say, most people are naturally considerate regardless of how they get around. This still doesn’t make UK cycling pleasant though. Just to be clear though, footway widening schemes whether or not they incorporate shared use are an abomination (IMHO). These narrow the carriageway so that people like Chris, who want to cycle on the road, are either put in a more dangerous position or they are holding up the motor traffic. This has been done without shared use on New Malden High Street. http://goo.gl/maps/CnDOf I’m afraid the motor vehicles have to queue behind me. * unfortunately, this way it’s stop-start, stop-start, at every driveway and road junction. I guess the parents think it’s less risky than having to negotiate pinch points and having close passes buffeting their kids with the backdraft and thus potentially causing them to fall. The horns of a dilemma indeed. I generally agree with almost everything on this blog, but I struggle to do so here! The pre-cycling pedestrian in me (who spent a lot of time being irritated with the pavement cyclists that are ubiquitous in this area) is never going to cease to dislike the breed! Maybe if its a wide pavement and its the early hours of the morning with not a single pedestrian in sight its acceptable (if nobody is there to see you do it, is it really happening?). But much of the time its just annoying. That motorists bully cyclists and steal their space doesn’t justify cyclists bullying pedestrians and stealing theirs. The vast majority of the pavement cyclists round here are anti-social and rude. So many times I’ve had them self-rightously swear at me (as a pedestrian) for not getting out of their way fast enough as they zoom at me at speed. Or they will whizz up behind and race past with even less clearance than white van man gives my bike on the road. Few of them seem to be in any way aware that they are not supposed to be there. And even when they wobble along slowly, if its a narrow pavement they are obliging pedestrians to move to give them space. Agreed, however, that the problem would surely mostly go away if there were proper cycle routes available. Though I fear some of these guys would then be as inconsiderate to their fellow cyclists as they currently are to pedestrians. I do say in the piece that anti-social pavement cycling should be dealt with – maybe I didn’t make that point clearly enough! I do cycle on pavements (very occasionally) myself, but when I do so I am careful to ensure I’m not annoying or alarming anyone – I will always dismount if it’s clear the pavement is too busy or too narrow, or if there’s going to be conflict. (Of course there is a degree of subjectivity here). That’s obviously not true for many other people who cycle on the pavements, who as you say show little or no regard for other people, and only for their own convenience. Its likely that it varies from place-to-place and elsewhere pavement cycling is the domain of a better-behaved group of people. I just choke slightly on the notion of declaring them heroes! That’s going a bit far! First up, I agree that the way to stop folk cycling on the pavements is give them an attractive alternative, as exemplified by NL. But the problem with pavement cycling isn’t that it’s antisocial, the problem is it is actually more dangerous for the cyclist than using the road. And when you watch PCs blithely riding across side-roads connecting to the main roads they’re avoiding without slowing down or looking then you can see why! So rather than demonise them for being anti-social we should be realising that scaring them off the roads puts them in danger and make that part of the reason for giving a better alternative. Cycling on pavements is a normal and seemingly accepted practice in Reading. Are ‘Dutch’ style segregated cycle paths the answer. This was originally posted just before the recent spate of fatal accidents on London’s roads. Where I live, it’s right on the sea front where there is a really good cycle path. However, there are cyclists who STILL use the pavement – this morning when I was nearly hit by one of these guys, I asked him why he wasn’t using the cycle path. He replied that he’d have to cross the road to do so. This isn’t the first time this has happened – I like to keep fit by walking everywhere, and if I can get it together to cross roads, some ****** half my age I’m sure is capable. I appreciate how dangerous it is for cyclists on the roads – I knew a couple of people who’ve had fatal accidents – but when there is a viable alternative to the pavement, it’s really irritating that cyclists don’t use it! As noted above, the issue is not with those who are riding on the pavement carefully and with consideration, because they have been forced off the road by the motor traffic, but with the imbecilles who have decided that if they have a bike then they can cycle anywhere and everywhere, with no regard to anyone else or the law. I’ve just walked out to get a sandwich in the centre of town and of six cyclists seen five were breaking the law. 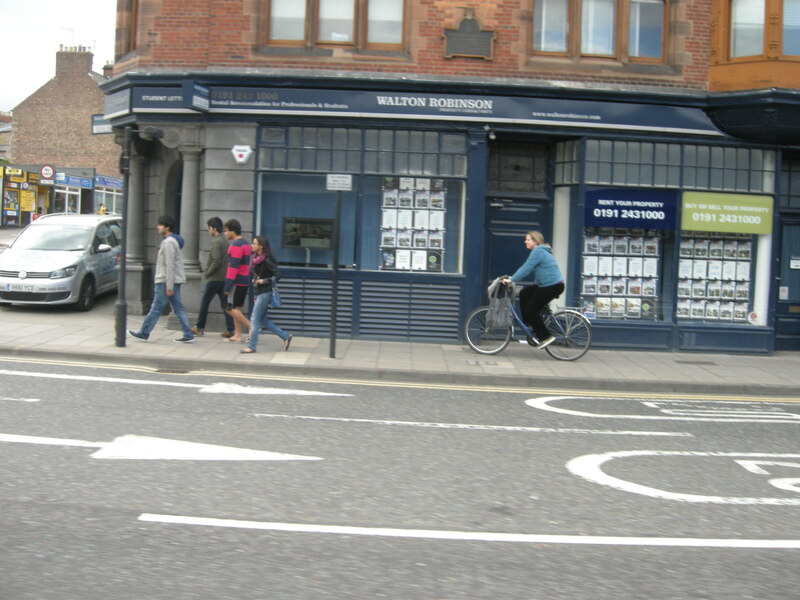 Four of those were running against the one-way traffic on the street, popping on and off the (fairly crowded) footpath to avoid motor vehicles – traffic calming here means that vehicles rarely get to 15mph. The other was casually riding down the footpath in the direction of the traffic, ignoring the mostly empty road beside him. You can’t tell me that these people should be seen as heroes. I’ve been hit by passing cyclists three times in the last couple of years, including in a railway station underpass, and two out of three gave me a mouthful of abuse for not getting out of the way so they could carry on offending. Both were old enough to know better and neither were obvious yobs in appearance, just in their behavior. As someone who walks to work, I have to say that cyclists on the pavement are a danger to life and limb. On my route, there are cycle lanes, but there are some who continue to use the pavement and will actually barge past pedestrians. These people should be prosecuted. When I cycle, I feel less endangered by motorostd than I do by cyclists when walking.